Samsung Galaxy C9 recently spotted on AnTuTu and GeekBench. Now, this same device has now appeared on GFXBench, it revealed some specifications and features of this Flagship phone that have already been revealed. 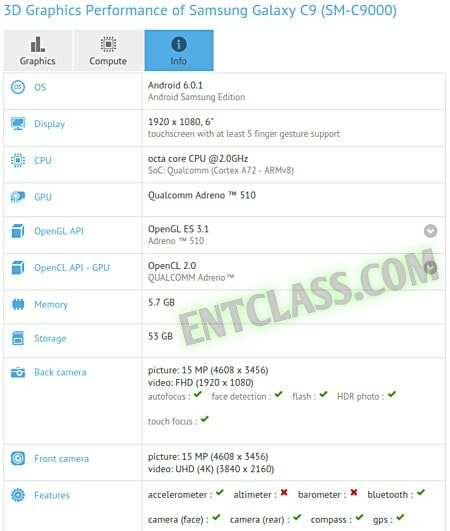 GFXBench listing also confirms that the upcoming Galaxy C9 will be fueled by Snapdragon 652 chipset and full HD screen display resolution, huge 6GB RAM + 64GB internal memory. Galaxy C9 seems as a selfie phone as it features a 16MP rear camera and 16MP front facing camera running on Android 6.0.1 marshmallow straight out of the box. To add to this, GFXBench also reveals that Galaxy C9 will have a 6-inches screen display and will have support for NFC. Galaxy C9 is said to be launched between October and/or November. Are you anticipating the launch of this device?